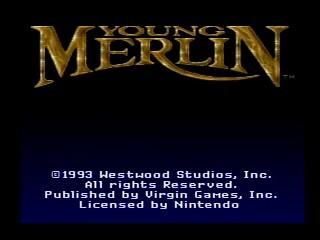 Released in March 1994, this game by Westwood Studios for the SNES features a young magician kissing mermaids, riding minecarts, crafting magic items, and solving puzzles to save the lands. A young Merlin, the wizard of legend, travels through peaceful landscapes, taking on grumbling villains to defeat the evil Shadow King. The Lady of the Lake makes an appearance to help Merlin in his travels. Best time: Single-segment 0:45:04 by 'DumDumDugan' on 2014-08-24. I have to say thank you to DaTeL237 because I mostly learned how to speed run Young Merlin by watching DaTeL237's 100% TAS. I had to adapt some strategies to make them easier, but I was surprised by how many of the early game tactics I could do. I'll describe those now since the first four minutes of the run are the most confusing and entertaining to watch. First, Young Merlin must collect three items and use them to defeat Thunder Pig. With a good setup and proper timing, Merlin can take damage after he defeats Thunder Pig. Doing this allows Merlin to move during the following cut-scene. During this cut-scene I grab a flower and bypass some enemies that I shouldn't be able to pass yet. Passing these enemies cuts some backtracking out of the game. Immediately after the first cut-scene, I stand near a group of meanies so they will damage Merlin after the Lady of the Lake appears. This again allows Merlin to move when he shouldn't be able to. It also lets me maintain the ability to unlock Merlin's position during another cut-scene because I never stopped talking to the Lady of the Lake. After taking damage from the meanies, I grab the fairy's reflection then slip past the meanies. Some RNG determines how quickly you slip past the meanies. I was able to get past them pretty quickly in this run. Next, I use the shooting star off screen to regain control of the camera and grab the orange gem. Then, I collect two more key items before returning the fairy's reflection to the pond. As soon as the reflection is returned, another cut-scene begins. Pressing start shortly after the scene begins unlocks Merlin's position again. During this scene the game transitions to another map. With proper timing, Merlin can transition to this map as well. Before the cut scene ends, I grab a wrench that triggers another cut-scene. At this point, two cut scenes are playing at the same time. When the first cut-scene ends, Merlin is allowed to move again. This skips the second cut-scene. That concludes the first four minutes of the game. No more "big" tricks are used until Merlin reaches Elven Hollow much later in the game. In this colorful hollow, Merlin needs to collect five wooden hearts and return them to a stump outside of the hollow. With the help of an invincibility potion and an enemy vile-ette, one wooden heart can be collected sooner than normal. This cuts some more backtracking from the game. Of course there are a few other tactics that save time throughout the run. First, cycling through items while moving is very useful. Memorizing how to cycle through the items at key moments is important. Occasionally, I choose to open the item menu to access the item I need. To save a little time in the item menu, I often cycle to an item closer to the one I need before I open the menu. Death warps are another important thing that saves time. For example, a dark dwarf in the mines is used to death warp out of the mines multiple times. I purposefully took damage while returning to the dwarf so he would kill me faster. One dangerous way I did this was by letting Merlin run out of air while underwater. When Merlin runs out of air, his hearts start to drain before he dies. I carefully allowed Merlin's health to drain a little before I used the bubble to refill his lungs. The final thing that will save a ton of time is simply good movement. It is vital to memorize the games many mazes. As with many of them, one wrong turn can set you back a full minute or more. Now I'll briefly describe some of the mistakes and bad RNG that occurred in this run. While completing the hedge maze I encountered a random enemy at a time I didn't expect. I mostly lost time here because I panicked and moved in the wrong direction for a brief moment. I didn't use the balloon when I should have in the mines. Therefore, I had to wait for a short animation to end before I could use the balloon in front of the broken ladder. I struggled to get around the statue holding the blue gem. It is easy to get stuck on terrain in Young Merlin, but this is the mistake that embarrasses me the most. A shark spawned while I was leaving the flooded cavern with the herring. Whither an enemy spawns here or not is random. My air was low so I had to use the balloon to avoid the shark. I hesitated while solving the second to last block puzzle. I also ran into the edge of a block while solving the last puzzle. My second wood heart grab was slow because I was a little slow in luring the enemy where it needed to be. I selected the wrong the flower when I needed to plant the rose, so I opened the item menu twice when I should have only opened it once. The spider's nest didn't freeze once during the first spider battle. This happens occasionally and I'm not sure why. I currently consider this bad RNG. The nest also failed to freeze once during the second spider battle. The nest typically fails to freeze more frequently near the end of the second battle, and I consider one miss to be untypically lucky. Of course, it is possible to complete the battle without missing at all. My most costly mistake probably occurred during the battle with the dragon, Cinder. I used the hour glass one more time than I needed to because I used it too soon. Finally, I should write a little about the final form of the final boss. At this point in my route, the boss will kill Merlin in one hit because I don't collect any hearts. Therefore, I have to play it safe. Meaning I chose to attack only after the boss leaps towards Merlin, and even using that tactic doesn't guarantee Merlin won't get hit if the locket's spell misses the boss. It is a very RNG heavy battle because of the ridiculous weapon Merlin has to use. All that aside, the final battle in this run went very well. The locket only had one complete miss.